In addition to selections from its permanent collection, the exhibit includes many special items from five long-time collectors of American Belleek. 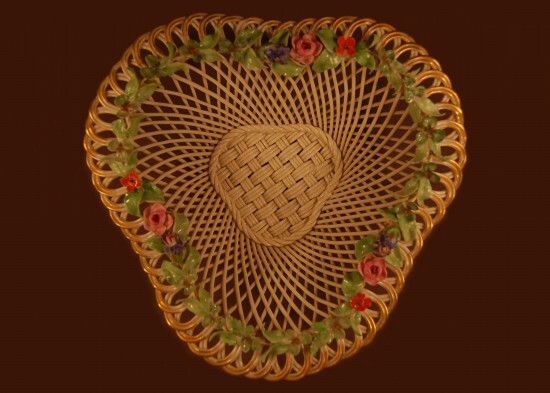 Each brings to his/her collection special interests and together we have selected some of the most outstanding pieces from the “first flowering” of American Belleek. This exhibit also serves to remind the viewer that the Boehm and Cybis firms originated in Trenton. The examples chosen for this exhibit are a combination of technical mastery and creative artistry. American Belleek began during the last quarter of the 19th century and continued into the first decades of the 20th century evolving into the Lenox company. Early predecessors include Tucker porcelain manufacturing in Philadelphia and a popular unglazed white porcelain called, parian. Technological advances during the Civil War period led to an extensive American Ceramic Display at the Centennial Exposition of 1876 in Philadelphia. Among the twenty American displays were some of this country’s finest examples of parian porcelain and china. Although English and European work over shadowed the American entries, the Centennial Exhibition introduced American Potters to the naturalistic forms, creamy body and lustrous opalescent glazes of Irish Belleek wares. In the decade following the Centennial Exhibition John Hart Brewer of Ott & Brewer aspired to create the equivalent level of quality in Trenton. Noted sculptor Isaac Broome, who had previously created the parian Baseball Vases for the Centennial Display and Cleopatra in 1877, was one of several fine modelers and designers who worked on the new fine art wares. 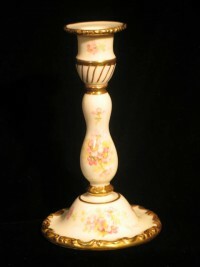 Brewer eventually brought in English painter and pottery designer William Bromley, Jr. to create the Belleek style body. By 1883 Ott & Brewer had a line of belleek products available for sale. Other firms followed, most notably Willets and the Ceramic Art Company (CAC), which produced very fine quality Belleek wares. Talented artists such as Isaac Broome and Walter Scott Lenox trained and worked in several Trenton potteries, which resulted in a distinct Trenton style of American belleek ware. Other firms elsewhere in the country, particularly in East Liverpool, Ohio and New York, pursued the same excellence and would each develop its own unique style. Trenton’s style is an eclectic mix of naturalistic designs with shells and flowers coupled with an exuberant use of gilding, gold and silver overlay, lustrous glazes, and enamel painting. The style varies from Romantic to Rococo Revival to Art Nouveau, sometimes all on the same piece. In tandem with the belleek productions there are also influences from the more traditional Worcester and Sevres china painted within panels or freely circumnavigating the object. Painting is both figural and landscape. The entire country became enamored with this style and amateur painting clubs sprang up everywhere. The Trenton potteries continued to attract professional artists, including William Marsh, William and George Morly, and Hans Nosek, especially to the Ceramic Art Company which became Lenox, Inc in 1906. The creation of fine art ware such as Belleek was so costly that most firms in Trenton were only able to sustain production for a few years. Ott & Brewer failed in 1894 and Willets only produced American Belleek for a few years. In contrast to other Trenton firms, the Ceramic Art Company (CAC) and later Lenox worked on a different model, creating only fine wares and factory decorated art wares. Once established, Lenox remained successful for almost 100 years.